I currently live in Melbourne, where in addition to my work with Bayside SDS, I act in an advisory and consultancy role with a number of Melbourne Specialist and Special Development Schools as well as other agencies that provide services for people who experience complex or profound intellectual disabilities, often in association with autistic spectrum disorders or multiple physical and sensory impairments. 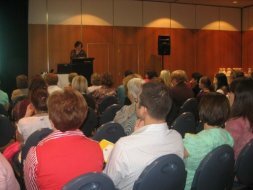 I tour Australia and New Zealand extensively, presenting a range of seminars and training days on Intensive Interaction to Special Educators, Speech Pathologists, Psychologists and allied health professionals in each state, as well as to Parent Groups, Care Providers and Adult/Children Residential Services. In addition to acting as a reviewer for the Journal of Applied Research in Intellectual Disabilities, I am pleased to respond to frequent requests to present papers and supplementary workshops at National and State-wide and International Conferences. 2012 was the first year that the Unit of Study ‘Intensive Interaction Theory to Practice’ was offered by Centre for Partnerships and Projects in Education, Deakin University Burwood Campus, Melbourne. This Unit of Study is the only university accredited training in Intensive Interaction in Australia. I wrote the unit to be relevant for teachers, allied health professionals, support workers and parents. Spread over three phases of 3, 2 and then 3 days of face to face contact, the unit is delivered during school holidays and weekends. Only those wishing to use the unit towards further study at Masters level are required to complete the two written assignments. An unaccredited version of this course was delivered to staff from 12 Queensland Special Schools through the support of the Special Education Curriculum Cluster. 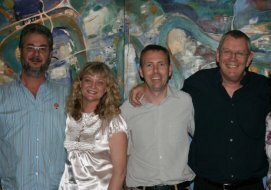 As a measure of how far Intensive Interaction has come in Australia since its introduction in 2003, Intensive Interaction Australia held its Inaugural Intensive Interaction Downunder Conference in Brisbane in 2008. We were delighted to welcome over 160 delegates from across Australia and New Zealand who came together for the first time as a group of practitioners. This coming together was repeated three years later when 180 delegates descended on Adelaide to ‘Explore the Plateau’ at the 2011 Intensive Interaction Australia conference. This theme provided the context for delegates to consider some important issues about using Intensive Interaction in the medium and long term. Graham Firth made a welcome return to Australia to address the conference as our key note speaker. The third Intensive Interaction Australia Conference was held in Melbourne on the 28th and 29th March 2014.